Another day, another iPhone 5S leak. This time it’s some new high-resolution images leaked onto the Internet that are claimed to show the fingerprint scanner rumoured to be part of the iPhone 5S which is set to launch next week. The image shown above is said to fit underneath the home button and provide a sensor to read your fingerprint by using nothing more than a simply touch. At the center of this home button is what is said to be the fingerprint scanning mechanism. The leak ties in with previous leaks that again claimed to show the iPhone 5S fingerprint scanner, but it was in much lower resolution and hard to make out. But this new high-resolution image clearly shows the part, allowing speculation that it could well belong to the iPhone 5S. 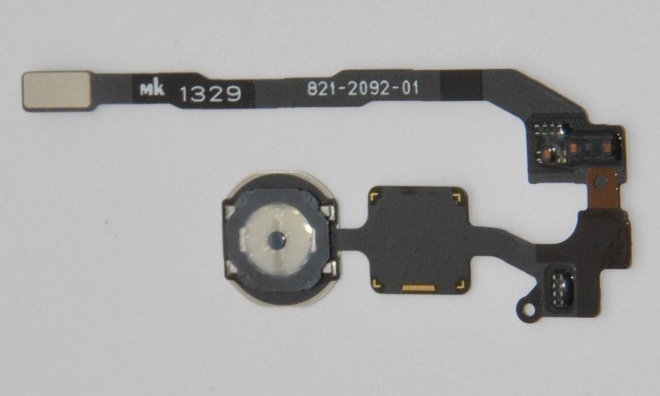 If it is the home button that is shown, it is incredibly more complex than the current part found in the iPhone 5 currently, lending some credibility that there is more happening on this piece of hardware than a simple home button. iPhone 5S – S has to be for Scanner! That sounds more than capable of functioning as a fingerprint scanner if you ask me, and it has long been rumoured that such a feature will be included. So Apple, you have the technology, you have the funds, you have the space for implementation since redesigning iOS 7, we’ve seen this leaked part – Are you introducing an iPhone 5S fingerprint scanner or not? You know the drill, thoughts in the comments section below.